데카르트주의(Cartesianism)란 르네 데카르트가 제안한 철학적·과학적 사상 맟 그 사상을 발전 및 계승하려는 17세기의 사상가들이 가졌던 사조를 말한다. 주요 학자로는 니콜라 말브랑슈 및 바뤼흐 스피노자가 있다. 데카르트는 흔히 자연과학의 발전을 위해 이성을 사용할 것을 강조한 최초의 사상가로 여겨진다. 데카르트에게 있어 철학이란 모든 지식을 포괄하는 사고 체계이자, 그러한 사고 체계에 의거해 지식을 표현하는 행위를 말한다. 데카르트는 마음이란 전적으로 육체적인 몸과는 구별되는 것으로 보았다. 신체적 감각 및 실제에 대한 인식은 때로 오류와 착각, 환상의 원인이 될 수 있으나, 신뢰할 수 있는 유일한 진리는 형이상학적인 정신에 의해서만 획득될 수 있다. 이와 같은 형이상학적 정신은 물질적인 정신과 상호작용할 수 있을지는 모르나, 몸 속에 존재하는 것은 아니고, 몸과 같이 공간 속의 질료로써 존재하지도 않는다. 정신과 육체가 어떻게 상호작용하느냐 하는 질문은 데카르트나 그의 추종자들에게는 끊임없는 난관이었으며, 데카르트주의자로 여겨지는 학자들마다 다른 답을 내놓았다. ↑ Chisholm, Hugh, 편집. (1911). 〈Cartesianism〉. 《브리태니커 백과사전》 11판. 캠브리지 대학교 출판부. ↑ Grosholz, Emily (1991). 《Cartesian method and the problem of reduction》. Oxford University Press. ISBN 0-19-824250-6. But contemporary debate has tended to...understand [Cartesian method] merely as the 'method of doubt'...I want to define Descartes's method in broader terms...to trace its impact on the domains of mathematics and physics as well as metaphysics. 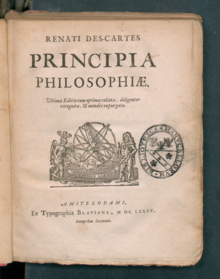 ↑ Descartes, René; Translator John Veitch. “Letter of the Author to the French Translator of the Principles of Philosophy serving for a preface”. August 2013에 확인함. ↑ “Cartesianism | philosophy”. 《Encyclopedia Britannica》. 2016년 1월 27일에 확인함.